July 17, 2014 – Thanks to sponsors Friends First upping their backing of our open race, the Laragh Classic, it will now be open to A1 and A2 riders. The program of races, run on Sunday, September 14, on a hilly, twisting 24km circuit around Wicklow, will consist of an A4 event, an A3 event and the showpiece Laragh Classic, seeing some of the country’s best riders compete for the Laragh Classic cobble. Junior National Champion Fintan Ryan used his local knowledge of the route to lift that, very heavy, trophy last year and already leading cyclists from UCD CC and the Velo Revolution Team have put the Laragh Classic on their agendas. Here’s what Brian O’Neill, Strategic Marketing Director, Friends First, had to say. “We were delighted to be associated with both St. Tiernan’s Cycling Club and the inaugural Laragh Classic Race in 2013. Fintan Ryan was a worthy winner and it was a particularly special day for him given the fact that the race took place on his local roads. “This year we have increased our support and this will enable the club to hold three races, including a headline A1/A2 event, which will be open to the top riders in Ireland. We hope that the challenging race circuit and generous prize fund continues to attract big numbers on the day. Friends First sponsored a race for the first time in 2013 and O’Neill explained why the company decided to support the sport. He said: “Firstly, we like supporting constructive activity in our local community and St. Tiernan’s Cycling Club is part of our community. As a leading provider of life assurance and income protection, we want to promote health awareness and the benefits of healthy living. Entries will open for all races on Wednesday, July 23 and riders are advised to enter early as start lists were filled two weeks before the closing date for registrations in 2013. 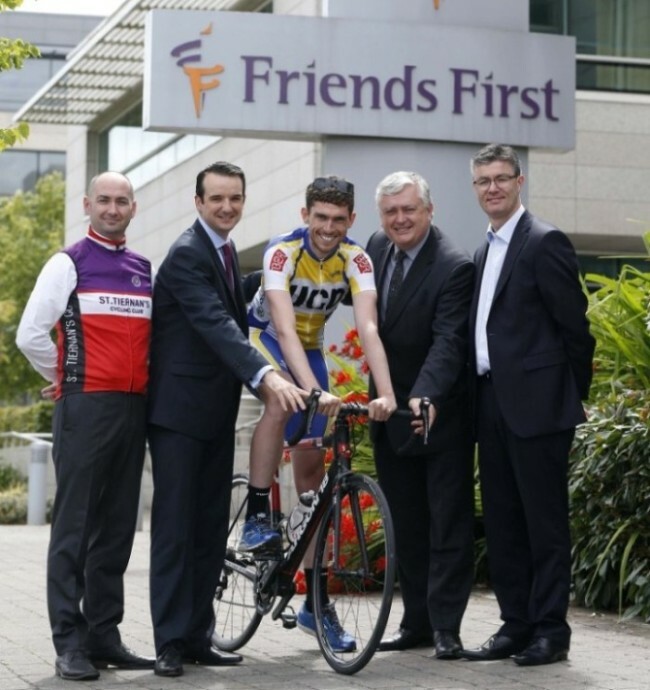 Friends First and St. Tiernan’s Cycling Club support Ireland’s leading riders, literally. No Replies to "It's official - Laragh Classic will be open to A1/A2 riders"